Since it was first built in 1811 by George Norris as a wedding gift for his bride, Rosemont Manor has been a place for family. Throughout the 200+ years since, Rosemont has been home to several different family lineages, but each has lovingly cared for the manor and its grounds, making sure that Rosemont was a warm and welcoming place for all who entered here. When Historic Rosemont Manor opened its doors to the public in 2010 for accommodations, weddings, and special events, we wanted to make sure that Rosemont never loses the legacy of being a place that welcomes you like family. In keeping with this goal, we’d like to introduce you to the folks who keep things running around here – our little Rosemont “family”! And when you come to Rosemont – whether it’s for a tea, to spend the night, or for a wedding or corporate event – we hope you feel like you’re part of the Rosemont family too! Professional Background: Biff holds his MBA, has thirty years of engineering and program management experience, and has owned a property management company. Barb has spent the last 30 years raising and homeschooling their twelve (yes, twelve!) children. As you can see, it’s a toss-up deciding who is more qualified to run the daily schedule and activities at Rosemont! Personal Background: Biff grew up in Ohio, graduated from the USAF Academy in Colorado, married his college sweetheart Barb, and now enjoys building soap box derbies with his children in his “spare” time. Barb grew up in Hawaii, graduated with bachelor’s and master’s degrees in rehabilitation counseling and worked as a counselor for the deaf. Barb now enjoys running 10K’s and half-marathons. 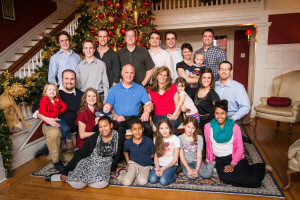 Biff and Barb had nine biological children (eight boys and one girl) before adopting a sibling set (two sisters and one brother) from Ethiopia in 2009. Favorite Spot at Rosemont and why: Biff remarks that his favorite spot is the balcony off of the Byrd’s Study (one of our deluxe guest rooms in the main manor). 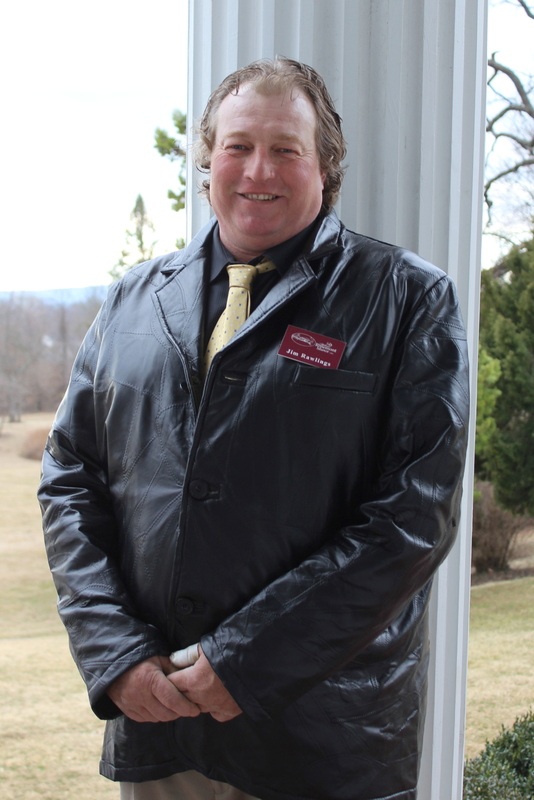 ”The view is amazing of the Grand Portico, the East Lawn, and the Blue Ridge Mountains in the distance,” says Biff. Barb enjoys the grand foyer where this recent family picture (which includes two daughters-in-law. one son-in-law and and six grandchildren) was taken at Christmas. Professional Background: Suzanne has 10 years catering experience, as well as cooking at home and for her church “for just about forever”. 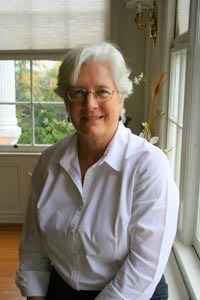 She has also worked as a computer programmer, office manager, and bookkeeper. Personal Background: Suzanne grew up living in various areas along the East Coast of the U.S., as well as in London, England and Accra Ghana. She now lives in Clarke County with her husband of 30 years. They have four adopted children from Russia who keep life interesting. Professional Background: Michael was educated at the University of St. Andrew’s in Scotland. He brings to Rosemont many years of experience in the wedding industry. Here at Rosemont, Michael makes sure that all of our events run smoothly. As an added amenity to our brides, Michael offers his services as a wedding planner to make the execution of your special day seamless and perfect. Personal Background: Michael’s family has resided here in the Shenandoah Valley since 1764. The family home was in the Strasburg/Toms Brook area. Several thousand acres of the property was burned in the Civil War during Sheridan’s marches. Favorite Spot at Rosemont and why: Michael has so many favorite spots at Rosemont, it was difficult to nail him down! He mentions the beautiful view from the Grand Portico, the elegance of the Churchill Suite and the Byrd’s Study, and the charm of the Byrd’s Nest. 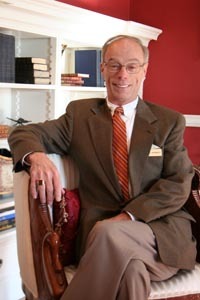 Michael is pictured here in the parlor, where he enjoys chatting with Rosemont guests. Michael admits, “To be honest, I like every part of Rosemont. Professional Background: Collette grew up with a passion for numbers. 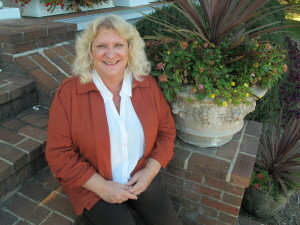 She has more than 25 years of accounting and administrative support experience. Throughout her career she has worked in several fields including construction, consumer fuels, non-profit, the State court system, mortgage organization and government contracting. Personal Background: Spending “valuable belly-laugh time with the grandbabies” is one of Collette’s favorite things to do. When she isn’t at Rosemont, she spends her time crocheting, cooking, and walking the fields of her farm to check on her cattle, . Professional Background: David is delighted to bring 26 years of hands-on catering management and menu design experience to Rosemont. David and his experienced co-workers have assembled a truly wonderful group of hospitality professionals. David and his company, “Celebrations Catering” have catered extraordinary bridal and corporate events throughout the metropolitan Washington, D.C. area. We are very proud to have David and his team as a part of the Rosemont family. Personal Background: David is an avid world traveler who thoroughly enjoys learning about countries, cultures, and cuisines. He finds trinkets, spices, and objects of art on his travels that he painstakingly carries home to his 1960’s Reston, Virginia lake home, where he enjoys hosting small gatherings of friends and family. Professional Background: Larry has worked as a general contractor in the Northern Virginia region for over 20 years. Larry and his right-hand-man, Joe Sowers, along with their team, completed all phases of the restoration, remodeling, and new additions to Rosemont, including the main Manor House, Carriage House, garage, and guest cottages. We love having Larry, Joe, and their team around so much, we just keep finding more things for them to restore. Personal Background: Larry was born and raised in North Carolina. He served in the US Air Force and lived in Idaho for 21 years before moving to the Winchester area in 1988. Larry has been married to his wife Jeanette for over 40 years. The couple has two sons and four grandchildren. Professional Background: Jacob recently graduated from West Virginia University with a degree in management information systems. He works full-time at the 167th Airlift Wing in Martinsburg, West Virginia in the Communications Flight as an IT Specialist. 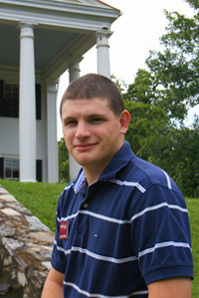 Personal Background: Jacob grew up in Virginia and has lived in the Berryville area for several years, graduating from Clarke County High School in 2009. When he is not working, Jacob also serves his community in the Civil Air Patrol as an active member and Deputy Commander for Cadets of the Winchester Composite Squadron. Professional Background: Jim’s training is in mechanical drafting and architecture. He has worked in the commercial and residential landscaping industry since 1985. 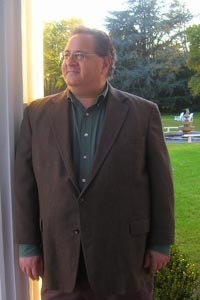 Jim has specialized in design build for many of Northern Virginia’s elite home builders. Jim’s passion is in the creation of many beautiful additions to Rosemont’s grounds, including the Garden Terrace, which he designed himself. 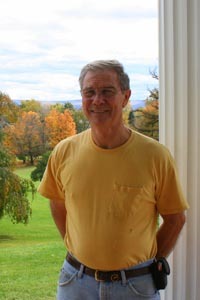 Personal Background: Jim lives in Harper’s Ferry, West Virginia with his wife Annette who also helps with the care and maintenance of Rosemont’s 60 acre grounds. Jim grew up in Carroll County, Maryland and spent over a year living in Cairo, Egypt. In his spare time, Jim enjoys reading, and stargazing as an amateur astronomer. All that’s missing from our family….is YOU! When you come to Rosemont, whether it’s for your wedding, corporate retreat, overnight getaway, or for a Manor House Tea, we want you to feel like you are at home – only with a little more pampering. Call us today at 703-879-5683 to find out how you can make Rosemont a part of your history.